Cable ties continue to hold their own. From utilization in the toughest professional industries, such as aerospace and the military, to helping marine mechanics make fast repairs to engines and trim, the cable tie keeps even the most sophisticated operations running. The cable tie is also used by the adventurer and survivalist. These outdoorsmen (and women) reach for cable ties to assemble quick splints, to repair zippers, to keep pesky insects out of their outfits, and for securing their field equipment. 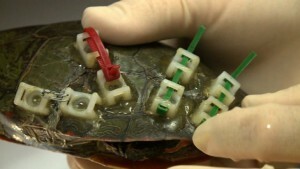 For all the stories we’ve heard about cable ties and the many versatile and clever uses they have, right now the most amazing one came out of Milwaukee earlier this year involving, of all things, a turtle. Unfortunately, turtles being run over by cars is a common incident all over the country. The possibility of accidents increase during the warmer months, with females out in search of an environment to lay their eggs. If the turtle is fortunate enough to survive, it is usually because of their hard shell, which often ends up shattered or broken. For the turtle, damage to that shell is disastrous. Even minor cracks can lead to infections and death. In June, a painted turtle, victim of a car accident, was brought into the Milwaukee Humane Society of Wildlife Rehabilitation Center with a broken shell. Something had to be done quickly, as it was believed the reptile wouldn’t survive another full day. After hearing this story, we did some research on our own and, to our surprise, we learned that cable ties for repairing turtle shells is growing in popularity in the wildlife community. Apparently, the usual procedure for repairing turtle shells (and, yes, there is a usual one) entails wires, screws, patches and drilling. But we here at Cable Ties Plus want to believe the Milwaukee Humane Society’s director, Scott Diehl, is — ahem — a big follower of our blog because he went straight into his toolkit for some cable ties. This procedure starts with a cleaning. The shell fracture is set after which cable tie mounts are positioned with epoxy. While that settles, the patient will be monitored for stress and kept hydrated. After the epoxy has dried, a cable tie is inserted into the mounts and a second cable tie is slipped over the first to hold it in place. A cable tie gun is used to pull the ties in order to tighten the shell fracture. The excess cable tie tail is then cut off. This is an effective operation because there are no patches to be removed and replaced regularly, and the healing process can be easily monitored. After a few months, when healing is evident, the mounts are removed and the turtle is released back into the wild. Cable Ties Plus is always on the prowl for great stories like these. If you have any, let us know so that we can share them with all our readers.